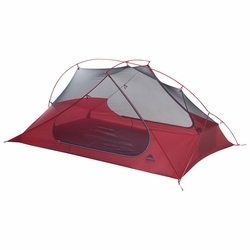 MSR Freelite 2 Tent. Designed to lighten your pack load on multiday and weekend backcountry trips, the FreeLite 2 saves you time and energy to pursue your outdoor activities. Whether you’re planning to pedal the Kokopelli Trail or climb a favorite route on an overnight backpacking trip, this ultralight, fully-featured double-wall tent lets you to perform at your highest level. Its unified freestanding frame sets up quickly and offers a roomy interior, lots of ventilation and two large doors for easy access—all the comfort, without all the weight. Ultralight: MSR's lightest freestanding, double-wall tent for two provides full protection without a big weight penalty.